"Cause-vertising is the need of the hour..."
Admits Ashish Makhija, GM marketing - Fabric Care, RSPL, about Ghadi Detergent's latest Diwali themed spot. The August cover story for afaqs! Reporter asked a crucial question that's looming over the ad world - does every brand really need a higher purpose? And, the cover image featured a powdered-detergent connection. Most of the major players in the space have taken a cause-led approach, amalgamating the brand's message with a cause with creative folk working at the anvil. RSPL's (Rohit Surfactants Private Limited) latest ad for brand Ghadi Detergent, takes up dignity of labour as its 'cause' and flushes out preconceived notions about day-to-day jobs like cleaning, doing dishes, washing clothes etc. being of a 'lower grade'. Ghadi has been using similar cause-led communication specifically during festivals as part of its campaign #SaareMaelDhoDaalo. The brand has done it on the occasion of Eid, Holi and previous Diwalis. 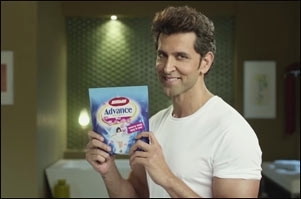 The ad has been conceptualised by ADK Fortune and features a pre-Diwali setting when household cleaning is in full swing. In the three-minute-long film, the son, who looks down on the domestic help, is taken to task by his mother. The mother then gets him to help with the cleaning which is when he realises that the work is actually tough and deserves respect, just like any other. The brand builds it's connect with Diwali cleaning and the idea of removing dirt from one's mind. It's interesting that almost all the players in this segment are playing the 'cause' card (Ariel's #ShareTheLoad or Surf Excel's #DaagAchheHai) instead of going the traditional route of better/best-brighter-easier-whiter cleaning. So, can too many causes in this limited space create clutter? And is it necessary to take up a cause? If so, why? And what if the cause steals the limelight, leaving little for the brand and the creative? We took this opportunity to raise those queries with Ashish Makhija, GM marketing - Fabric Care, RSPL, who is of the opinion that in advertising, although highlighting functional benefits of the brand plays a very important role, it will continue to do so only if there's new news. "It came to a point where all brands were claiming brighter and whiter clothes and thus came cause-vertising to influence purchase decisions based on affinity towards a brand. The right balance of functional communication and cause-vertising is the need of the hour," Makhija says. ALSO READ: Does every brand really need a higher purpose? About creating clutter, he says, "I think this depends on the message a brand is trying to get through and obviously, its creative representation. It is critical to find a correct fitment for the brand, so much so that it doesn't seem like a force fit. This is something brands need to work on while drafting their strategy. So far, this campaign is setting new benchmarks for us in terms of engagement levels and hence, we've clearly managed to break through the clutter." But what does a detergent brand have to do with festivals? And does the segment see seasonal spikes in advertising? Makhija says that consumption patterns are mostly consistent throughout the year and so is advertising with no such specific time of the year or season. "The plot of the film is around pre-Diwali preparation where traditionally, we clean and decorate our homes. It reflects on our ignorance towards dignity of labour and I am sure a lot of people will relate to it," Makhija adds. Akashneel Dasgupta, NCD, ADK Fortune says, "Good brand recall doesn't necessarily need the name to appear six times. It is about how well the purpose and the promise of the brand are integrated within the plot. This is our fifth film under the '#SaareMaelDhoDaalo' series and in each, the brand name appears only in the end and viewers have never missed it. Yes, there are many brands doing cause-based advertising, but it depends on the power of the creative to stand out. This piece for Ghadi has already gone viral across multiple platforms so there's no question of getting lost in the clutter." When asked about the pre-Diwali advertising rush, Dasgupta says, "In my experience, I have always had a peaceful Diwali, but a crazy Dussehra. All the Diwali frenzy actually affects the fortnight before, as everything is already out by Diwali." "The creative for Ghadi does not have a single element of Diwali. The story is devoid of the usual Diwali clichés like lit up homes, picture-perfect people etc. 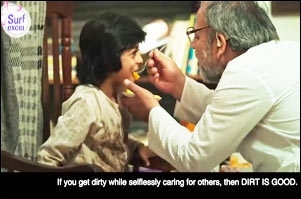 For us, Diwali is just the context for highlighting another aspect of 'cleansing' to instil dignity of labour," Dasgupta adds about the ad's connection with the festival. About that brand riding on the purpose wave and clearly off traditional hard-selling, Dasgupta states, "Both will go hand-in-hand. The traditional product-led messages will also continue to be aired. It depends on the objective of the communication. When we have in hand a task to inform/demonstrate a new addition to the product or its delivery, we would also do the traditional form of messaging." We asked industry experts about the ad and the overall situation. Anish Varghese, NCD - Isobar India points out that the segment lends itself easily to purpose-led messaging because it's a low involvement category. He says, "It's a challenge to build brand passion in this category. So, brands need to focus on what purpose they are into and convert consumers by using beautiful storytelling, which is relatable." "To have a strong connection with the brand we need to make sure the purpose-led message is intrinsic to the brand proposition; a direct correlation. This Diwali they have a strong message to share," Varghese shares about the clutter and the ad's position in the crowd. However, about brands ditching the traditional hard-sell, he adds, "Hard-selling today is a bad idea. People are not expecting it any more, especially in an interactive medium, which has a strong connection in our daily routine." He attributes a strong storyboard and adding micro-moments that can marry both brand and the core message to avoid having the limelight stolen by the cause. Creative consultant Pradyumna Chauhan says that there is a lot of saturation in the detergent segment with brands running out of propositions for standing out. "Since the cause-led wave is in, brands can still get a takeaway even if they don't get the top spot. They can still get some traction with the fifth or maybe the tenth spot. For Ghadi Detergent, this ad is almost a necessity, given the current scenario of advertising," Chauhan states. "Previously, there were lesser products and brands had 'unique selling propositions' and claims of a better product. Then came the phase when brands wanted to better the consumer with 'emotional selling propositions' by building deeper connect. Hard-selling went out the door followed by technology taking over and replicating things," Chauhan adds. "Now, the coming of the social media led to a new movement-led trend where companies went from building a better brand and product to building a better world. The funny part is if every brand is out to build a better movement, who'll build the brand?" says Chauhan. "Maybe it's the evolution of branding and marketing. The tricky thing is to decide the role of advertising. There can be brands which strictly stick to the brand proposition narrative. There will be brands on a quasi-role taking both the proposition and the cause. Others might be cause-heavy," he explains. He continues, "Today, it's like all detergent brands can do the cleaning, but the timeline is used to tell a different story with a cause. So if all can do the cleaning equally, why advertise? The brand's sharpness is kind of lost in the cause. Each category has to evaluate itself to understand what life stage it's in; what is the saturation and the differentiation of individual brands. Only then one can understand what to communicate." Iraj Fraz Batla, ECD, DDB Mudra Group says, "The story touches a chord. 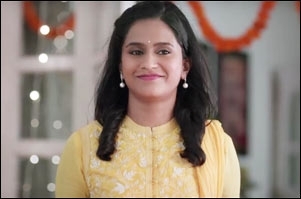 Of course, do-gooder stories with the house help during Diwali have been trending the last few years - Reliance Fresh's tale of inviting the maid's family over and Dainik Bhaskar's sammaan story of visiting a maid's home for Diwali come to mind. Most brands seem to gravitate towards a societal change narrative for Diwali. While this one feels a bit trite, the message will hopefully get through to the audience and add to Ghadi's on-going campaign with their last year's policeman ad, ones for Holi, Eid etc." Is Nirma trying to get men to do the laundry?